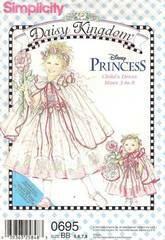 Child's sleeveless dress, cape, headband and wand and matching pattern for 18" dolls such as American Girl. Hip 25, 26, 27 and 28. Uncut and complete. Envelope and contents are in excellent condition. Copyright 2002 and now out of print. This pattern was released by Simplicity as number 0695 and 7198. You will receive either number, depending on current inventory.